Dope track/video from C.i.D. 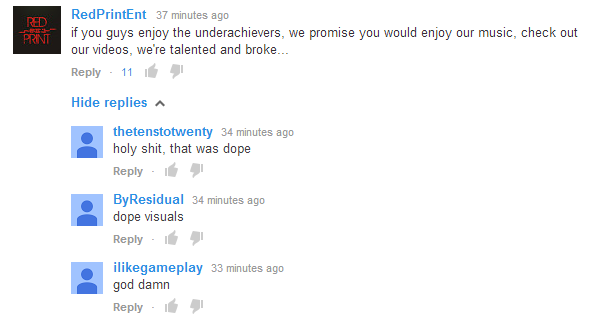 Found out about this one through the Youtube comments on The Underachievers’ new video. A comment from Red Print (who C.i.D’s part of) promised that folks who enjoyed the UA would also dig the stuff they’re putting out. Normally I click these comments to see how bad it is compared to whatever claim they are making, was pleasantly surprised to see that these dudes are actually putting out some legit music that lives up to their promise. Everything about this video is nice. C.i.D’s great on the mic and the smooth production by Moods is fantastic. The video production is even at a high level here. All of this is surprising to me given how young the crew appears to be, I’d definitely keep these dudes on your radar. Wouldn’t be surprised if these guys get more attention in the future. According to C.i.D a tape will be out next summer, looking forward to checking it out. You can download Daily Routine for free over on Soundcloud. This entry was posted in Artist, Download, Music, Song, Video and tagged C.i.D, Moods. Bookmark the permalink.